When you try to copy a file into a folder and there is already a file with the same name, nautilus just says that the file exists and asks if you want to replace it. so that the user could make an informed decision as to which is the newer file. Thank you for your bug report. I'm marking this as triaged and will forward upstream. from several sources to the same destination with the idea to merge all files in one directory. Several had the same name, although they might or might not be the same kind. The above dialog appeared with only the choices "skip all", "replace all", "skip" and "replace". - At that moment I was not able determine if I want to replace or skip, so I wanted to investigate these files. windows while the dialog is displayed for one. - When I found that out I wanted to abort the action.. however there is no button for that. The close button does also not do anything, so the only possible approach seemed to kill nautlius. - Also instead of skip or replace, I would like to have the option to rename the file to distinguish them. Note that I like the option "skip all", as most filemanagers are limited to only three: replace "yes","no","all". For those interested.. my workaround I used to overcome above problems. upon a conflict choose "skip all"
then delete, rename or do some other action with. I agree. It's even worse when nautilus hides the "skip all" etc window behind another nautilus window so that it just appears to have frozen. It would also be a nice feature in the "skip all" window if nautilus continued to copy/move the files that is able to while it waits for your input. At the moment you can set up a 10000 file copy, leave the PC because you expect it will take a long time, and when you come back you discover it has copied only 10 files and is asking you about file 11. Agreed, it should display a bit more information about the files (size, date, etc). Yeah, this seriously hinders usability. I was shocked the first time I realized I was going to have to go into the other folder, look at the size and dates, and compare them with the others file myself, for each file that already existed, each time I did this. Also I can't believe this has been a bug in Gnome for 7 years, and they even recently considered marking it as WONTFIX! This seems rather important/crucial for the default display manager of an OS. It could also show tumbs when coping images (.png .jpg .bmp etc). It must be Ubuntu fix. Because it would never be fixed in Gnome with their "user-does-not-need-to-know-what-a-hell-is-he-going-to-delete" philosophy. Is any work being done on this? Especially for new users this behavior is really annoying. Filesize and modied times should be the minimum of information given on replacing files. If you have no information on what is being overwritten than you can just leave out the entire dialog because it doesn't make any sense. I don't use KDE, but I like very much that its file manager (what's it called this week?) has this kind of attention to detail. It impressed me the minute I saw it. Of course users can't make an informed decision without access to relevant information. Perhaps if the concern is the delay required to gather this information, it could be hidden behind a "more details" toggle (one like that used in the GNOME update manager and others) and only generated on request. 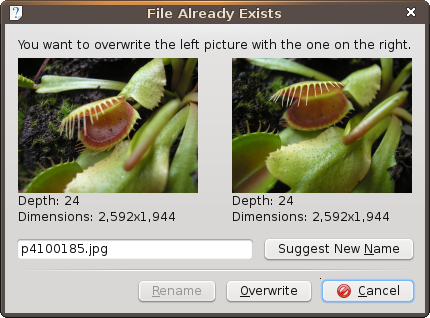 I would also like to have an option to actually open the files, i'd suggest having an icon for target and destination files, with the tooltip with the information (alternatively information about files can be just written somewhere near the icon). Size, date, etc info would be very helpfull! I Absolutely agree on this one. I've experienced that replacing the same file not as simply as it shout be. This situation is ridiculous. I had to abort the action I was doing and go do it from the console several times now. Date changed and size would be nice to have, but knowing if the file being replaced is older is absolutely essential. Useful, but this does not alleviate a pain or frustration -- it's a new feature. Not a paper cut. Looks like it is in progress upstream anyway, so no need for extra attention. I disagree. Without info about replacing files user has to find these files manually and look in their properties. This is one of the most annoying bugs of usability. Also disagree, it fits perfectly the definition of papercut: system-wide, impact standard workflow, easy to address, problem with existing feature (rename/copy) and relates to usability and design. And the progress being made upstream is only a 1+ year old discussion about design on the nautilus mailing-list. > Also disagree, it fits perfectly the definition of papercut: system-wide, impact standard workflow, easy to address, problem with existing feature (rename/copy) and relates to usability and design. I have to agree with the previous posts. I think that this is an merely an usability and design issue (it makes replacing only the older files painful) about an existing feature (the dialog for replacing a file), it's not an entire new feature itself. Which is exactly what papercuts are about (they even mention nautilus, and file-copying as examples). I couldn't think of an usability issue more suited than this one to be fixed for 100papercuts. And kenden is totally right about upstream discussion. Ok, let's reconsider this as a paper cut. Psy[H, kenden, ferk, will you please investigate upstream about whether this will be trivial to add? The upstream bug has been open for eight years, so my guess is that it's not simple to fix. This is not a paper cut because, although you might not consider this a "feature" per se, it is in the sense that it requires more than a few lines of code (my guess is at least 50 lines of C) to address. If this turns out not to be the case, great. > it's not simple to fix. upstream nautilus supply this behavior though. The problem in the upstream is that some developers consider information about replacing files excessive. see comments 15, 17, 23 and proposals about hiding info by default. I personally like proposal in comment 14, but without hiding the first section. because when it comes to rapid decision about several files that will result in excessive annoying clicks unhiding info about each file. like I can get a PPA up for testing. Great progress is being made on this, but for now I am replacing it in this round with bug #387680, which is more of a paper cut and less of a new feature than this issue. Sorry for ranting, but this is ridiculous. I can't believe I'm still seeing this issue in Karmic. This bug was opened more than two years ago; the last message is five months old, saying "great progress is being made on this". Well, I don't see it. I don't want to attack anyone personally, but on the whole, not getting this problem fixed is unworthy of what aspires to be a modern operating system. It's really impossible to close this bug? I believe not. When i copy many file i must use dolphin. I use dolphin only for this! It's not a good think. Please work on this bug! A good papercut for Lucid. I fully agree, at least Nautilus could tell us, on the "replace warning" box, dates of source and destination file, and perhaps the size, in order to make the decision easier (than cancelling and go to verify). Or have an option to enable to get this information when a file has already the same name as one we want to copy. The examble showed in comment #7 is a nice one. Let's say that thumbnails isn't the first priority here. Well, files' prorerties are. Users should know more about that dialog. Over eight months after "Great progress is being made on this" - any news on this? a parte "sostituisci file" in nautilus è la più incompleta ci devono stare le opzioni più essenziali (sostituisci tutto, sostituisci solo questo file oppure non sostituire9 e inoltre si devono aggiungere le informazioni dei file. We should stop posting "It also could". This bug has a very specific scope. Something very simple, and very urgent: "display file information when propmting to replace". Sophisticated solutions are proposed on other bug reports. Please comment in English, otherwise the most part can't understand. Thank you. Ciao, devi commentare in inglese, altrimenti nessuno capisce niente di quello che scrivi, ok? Fixed in master by Cosimo Cecchi! See the attached image for a side by side comparison. Why can't an enhancement like this be in an update, rather than having to wait until an entirely new release? When we have the link for the upstream bug at the top of the bug report , it is easier than searching for the upstream bug link in the comments. looking forward to this one!! Thanks guys! I am pretty sure this has already been fixed in upstream nautilus. At least it is in nautilus-elementary and the developer stated somewhere (can't remember where exactly) that the new replace-dialog is not his doing but a benefit from just using the latest nautilus version. (in particular as sizes are usually only approximate). specifically for *.iso and similar). > (in particular as sizes are usually only approximate). > specifically for *.iso and similar). > if you want to replace it.